This article is about the popular devotion to the Virgin Mary. For the carol with the title The Seven Joys of Mary, see The Seven Joys of Mary (carol). The Seven Joys of the Virgin (or of Mary, the Mother of Jesus) is a popular devotion to events of the life of the Virgin Mary, arising from a trope of medieval devotional literature and art. Alternative choices were made and might include the Visitation and the Finding in the Temple, as in the Franciscan Crown form of Rosary, which uses the Seven Joys, but omits the Ascension and Pentecost. Depiction in art of the Assumption of Mary may replace or be combined with the Coronation, especially from the 15th century onwards; by the 17th century it is the norm. As with other sets of scenes, the different practical implications of depictions in different media such as painting, ivory miniature carving, liturgical drama and music led to different conventions by medium, as well as other factors such as geography and the influence of different religious orders. 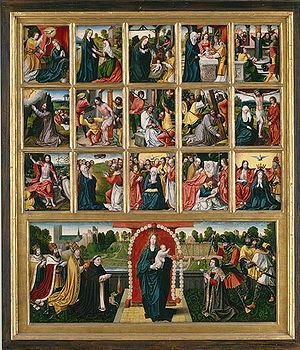 There is a matching set of seven Sorrows of the Virgin; both sets influenced the selection of scenes in depictions of the Life of the Virgin. Originally, there were five joys of the Virgin. Later, that number increased to seven, nine, and even fifteen in medieval literature, although seven remained the most common number, and others are rarely found in art. The five joys of Mary are mentioned in the 14th-century poem Sir Gawain and the Green Knight as a source of Gawain's strength. The devotion was especially popular in pre-Reformation England. The French writer Antoine de la Sale completed a satire called Les Quinze Joies de Mariage ("The Fifteen Joys of Marriage") in about 1462, which partly parodied the form of Les Quinze Joies de Notre Dame ("The Fifteen Joys of Our Lady"), a popular litany. ^ a b c Ball, Ann (2003). "Seven Joys of Mary". Encyclopedia of Catholic Devotions and Practices. Huntington IN: Our Sunday Visitor. p. 522. ISBN 0-87973-910-X. This page was last edited on 30 June 2017, at 02:12 (UTC).